Staged Reading: Black Pearl Sings! 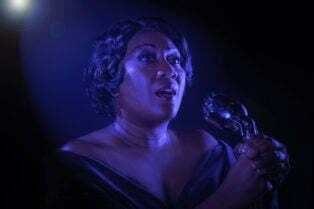 Presented by Alliance for New Music-Theatre, Frank Higgins’ play, Black Pearl Sings!, features two extraordinary women in Depression-era Texas: An ambitious Library of Congress musicologist, searching for the African roots of slave songs, discovers the musical gifts of an African-American woman with a soulful voice and steely spirit. Black Pearl Sings! is a powerful evocative story of how they must work together to fulfill the goals of both women. Theirs is a journey of race and reconciliation, religion and tenacity, the historical search for the origins of indigenous folk music, the preservation of the musical heritage of a people, and ultimately of healing and understanding. Based on legendary folk singer/guitarist Huddie “Lead Bell” Ledbetter and LoC folklorist John Lomax, the work adds the additional dimension of gender and the courage it took for women to break outside of their jails. Thomas W. Jones II directs, whose production last year of the play in San Diego won critical and popular acclaim. Local singer-actress Roz White reprises the lead in this drama with over 20 American folk and spiritual songs and “inhabits the role of Alberta “Pearl” Johnson like it was created for her… blessed with a voice that resonates and captures the soul of the music with a strong gospel uplift.” Susan Galbraith steps out of her Alliance Artistic Director role, returning to the stage in the supporting role of Librarian Susannah. Black Pearl Sings! is part of a larger project and collaboration between Alliance for New Music-Theatre, the Library of Congress and Duke Ellington School for the Arts. Duke Ellington students will participate in a workshop series to introduce them to LoC collections, which they will use to inspire their own original theatrical works and other creative expressions. The reading will be followed by a discussion of the work led by NJ Mitchell, Alliance Director of Community Partnerships and Public Programming. Black Pearl Sings! will be in full production from April 17 – May 5, 2019 at the Universalist National Memorial Church at 16th& S Street NW. For a full schedule of performances go to www.newmusictheatre.org.